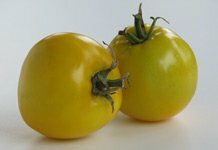 The Yellow Taxi Tomato is a brilliant lemon-yellow tomato which has characteristics that are suitable for cooler climates with shorter growing seasons. This determinate variety, which is also known as the Taxi, produces delicious, meaty, uniformly round fruit with high sugar content. In my experience, they have been blemish-free fruit as well. They are good slicers and work well for sandwiches. The cold-tolerant Taxi can be grown well in most areas. Because of their striking color, you'll find a number of gourmet recipes featuring these beautiful yellow tomatoes. These three- to four-inch fruits can definitely be grown in hot humid growing regions as well. 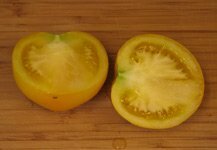 I recommend buying Yellow Taxi tomato seeds at TomatoFest because not only do they specialize in heirloom tomato seeds that are certified organic, but their service is great and their staff friendly.